Warning: This tutorial is seriously photo heavy. I wanted even beginners to be able to make these! 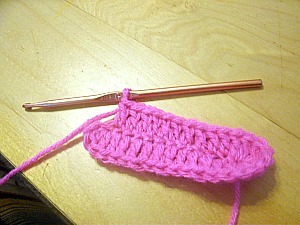 I have been crocheting like crazy lately. I am trying to destash a bit and I am also (for lack of a better term) dieting. Well I am just trying to lose a little weight and eat more healthy and crocheting keeps my mind off of wanting to eat junk food all day! 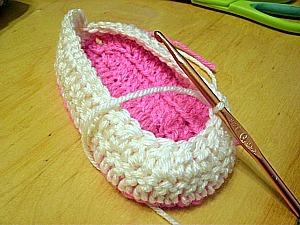 I have been wanting to make my daughter a pair of slippers for some time now. 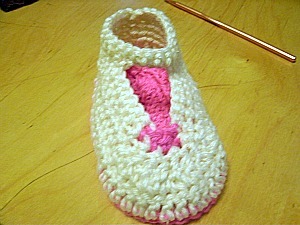 There don't seem to be too many toddler slipper patterns out there so I just went on to make my own. I wasn't planning on putting the pattern up here as it was supposed to be just plain old slippers but after I made the first pair it just hit me that these needed a bit more. I started thinking about it and my floppy bunny hat pattern and the next thing you know I was writing down a pattern and taking a bunch of pictures. I mean, people need this pattern way before Easter so they have time to make them! I tried to make the pattern as in depth as possible so that even a beginner could give it a go. As always, my patterns have not been tested so if you run into a problem I would appreciate if you emailed me and I will change it (find my email in the Contact page below my header). 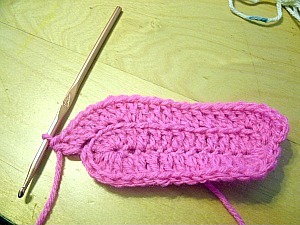 Now for the pattern itself, it took me a long time (a little too long!) to get it just right. There was a lot of math (at least a lot for me! ), and ripping out and trial and error and such so I would appreciate if you took a moment to read my pictures and pattern use policy if you plan on selling the finished product or linking to this product (which I am always super grateful for!). So yes, you can sell the finished product :) but not the pattern. Like I said, please read my policy first. If you do happen to sell some or just really appreciate the pattern and would like to contribute to the blog, you can find my donate button on the right sidebar. Thanks!!! I also recently made a Facebook page. 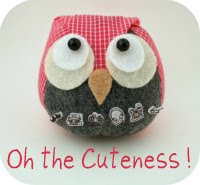 If you have a FB account make sure to like my page (you can find the "like" button in the right sidebar) so you can get instant updates on new patterns and blogginess :) Also, if you haven't become a follower yet, don't forget to! First I want to discuss gauge and yarn and all that boring but important stuff. 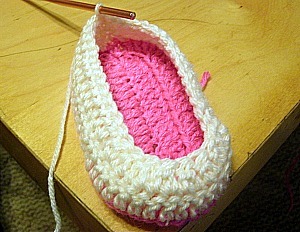 The first pair of slippers I made using Red Heart Super Savers yarn. 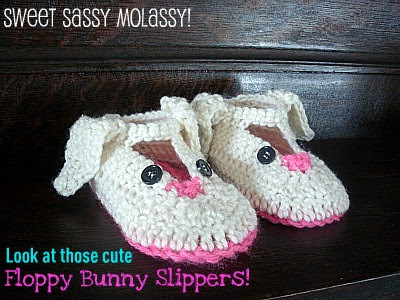 The bunny slippers were made from Mary Maxim yarn which is another worsted weight yarn. I used the same hook and same pattern but you can see the difference. Just goes to show how the slightest change in any element can result in a different pattern. I highly suggest you check the gauge before starting. Also there is no instep on these slippers. They are both exactly the same. I don't think that an instep is necessary on a toddler slipper. I mean, their feet are usually so chunky there isn't really an insole anyways :) They fit my daughter great. Size: These slippers fit perfectly on my 2 1/2 year old. I would say they could probably fit nicely on most 2t-3t girl's feet. Gauge: Since this is a pretty quick project, I just measured the finished sole of the slipper and it was 5 inches long and 3 inches wide. If yours is measuring too big or too small I would try changing hook sizes. 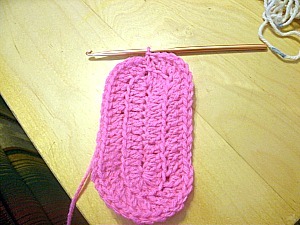 Yarn: Worsted weight, but like I said above, it is best to check the gauge on this project. Other: 4 buttons for the eyes. Buttons are a choking hazard to children under 3 or children who still chew on stuff. Please use buttons with caution! Round 1: Ch 2 (counts as your first dc and will continue to count as a dc for the rest of the pattern), 2 dc in 3rd chain from hook. 10 dc down the foundation chain. In the last stitch, dc 8 going around the end like you see in the pic above. Now, on the other side dc 10 times down the side. Dc 3 times in the same space that you have your ch2, 2dc. 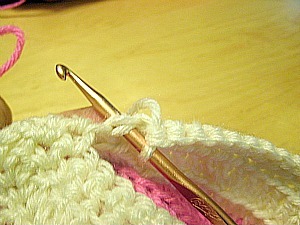 Join with a slip stitch in the top of the chain 2. Ch 2, dc in same space, 2 dc in next space, 2 dc in next space﻿ (6dc altogether. Ch2 counts as dc). Dc in next 10 ch down the side. 2 dc in next space times 8 (in the pic above I have just finished the first 4 groups of 2dc). 10 dc down the other side. In the same space as your ch2 dc, add 3dc. Don't join yet. I did in the pic above on accident. You will want to switch colors (refer to next pic). You should now have an oval like the pic above. 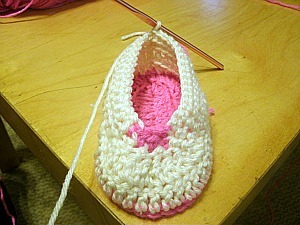 The heel is where you started and the front (with the 8dc) is slightly bigger to fit all those cute little toes. Join with your white. Ch 2. Dc in next space (make the chains in the front loops of the previous row). Dc in each space around. There should be 48 dc total (ch 2 still counts as a dc). 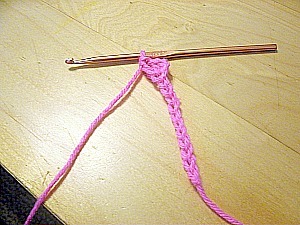 Join to the top of the ch 2 with a slip stitch. Ch 2, dc in each of the next 15 spaces. Dc tog (or dc decrease) in next stitch. Repeat dc tog in next 3 spaces as shown above. Dc in next 16 spaces. Join to the top of the ch 2. Ch 2 (counts as first dc), dc in each of next 15 spaces. Dc tog 8 times (this means you do 8 dc tog over 16 stitches. The dc tog will reduce the amount of stitches to 8). Dc in each of the next 16 spaces. 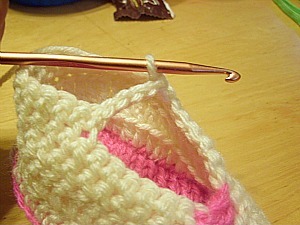 Join with a slip stitch in the top of the ch 2. (Forgot to take a pic of this but I think you probably get the it by now) Ch 1, sc in each of the next 15 stitches. Here is where you will make the nose. 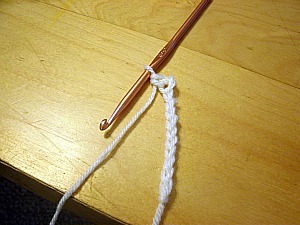 Put your hook through both loops (I used both loops for the next 3 spaces. I thought it made the nose look better) of the first dc tog of the previous row. Join your pink color with a sc. Hdc in each of the next 2 spaces. Sc in next stitch. Cut off your pink and join back with your white. sc in each of the next 16 spaces. 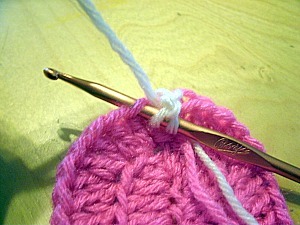 Join to top of ch 1 with a slip stitch. Ch 1, sc in each of the next 9 spaces. Ch 4 (this is going to be the "strap"). 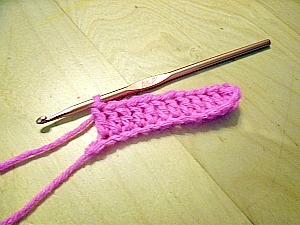 Join to opposite side (17th space from your ch 4) with a slip stitch. Sc in remaining spaces. 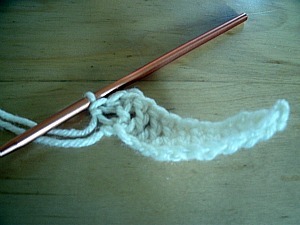 Join to top of ch 1 with a slip stitch. Ch 1, sc in each space around. 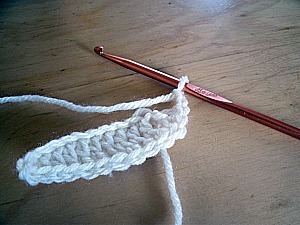 Join to top of ch 1 with a slip stitch. Ch 12. Sc in 2nd ch from hook. Sc in next ch, hdc in each of next 2 spaces, dc in each of next 2 spaces, trc in each of next 5 spaces. 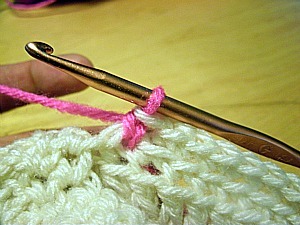 (it gets a little confusing here but reference the pic if you get confused) Working in the side of the last trc slip stitch twice. Working up opposite side, 5 trc, 2 dc, 2 hdc, 2 sc (just like the opposite side). Tie off. Make 4 ears altogether. 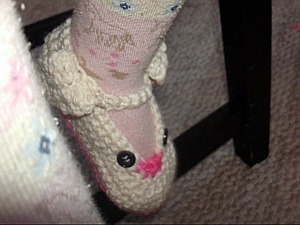 This is the only picture I could manage to get of the slipper on my daughters foot. Believe me they are adorable. She just loves them! She loves a new pair of shoes and to her these are just as good as a shiny new pair of shoes :) I hope they are perfect for your little Easter bunny too! it will be my next project.. Thanks so much :) Glad you like them! Thanks Sara! They are a pretty quick project too. I love your pattern - thanks so much for sharing! 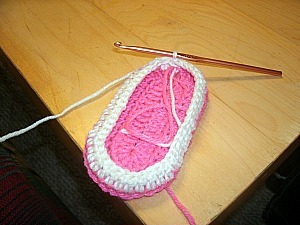 I started on the slippers the minute I saw the pattern but am having some trouble understanding the instructions. After the 1st row of white there are 48 stitches. The next row is 15 DC, 4 DCTOG (which takes 8 stitches), and 16 DC. This makes 39 stitches. Am I missing something - sure hope you can help!!! Fixing it right now and emailing you! Thanks for letting me know :) I probably shouldn't type these things up when I am tired! Do you have a way of making this for a 0-3 month? Also for 11month? I don't, but you could try hdc on the sole for the 11 month old. The 0-3 you would could try sc although that might be too big. 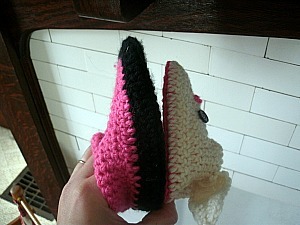 If you find a good slipper pattern you like for those sizes, you could add the ears and embroider some eyes and a nose on them. 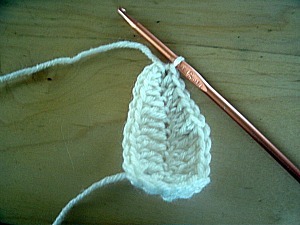 I'm fairly new to crochet, I'm a knitter, so your picture tutorials are fantastic for me. First a couple of owl purses and intrepidly on to the bunny hat and slippers. My second cousin had an extreme preemie and these will be waiting for her. I figure some kind of fluffy fingerling will work. Thank-you so much!!! These are too cute. 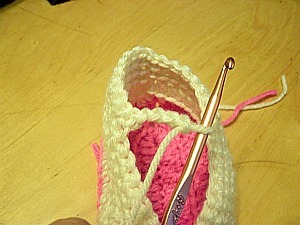 I am trying to make these however i am having trouble understaning the second row of the sole. Could you please clarify or write them out as a crochet pattern. Not sure I can really clarify it anymore, but I can try. 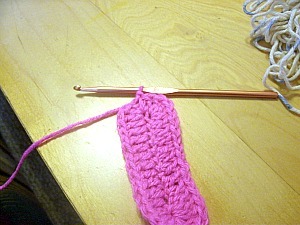 Basically the chain 14 is the smack middle of the sole, and you are going to crochet up one side, around, and down the other and join. Do the pictures not help? What exactly is confusing you? Ugh so sorry. Yes it should say dc not sc. Thanks for the heads up! Love it! Pinning it, then making it! I am so grateful for the pictures... 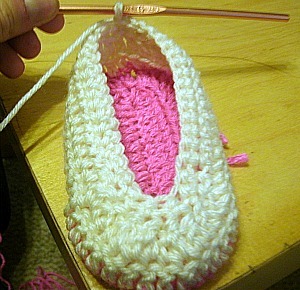 I am primarily a knitter and have had a couple of failed crocheted slipper attempts. Thank you so much for sharing. LOVE these!! Do you have any recommendation for making these bigger? My girls are 6 and 8 so their feet will be way to big for these little cuties. 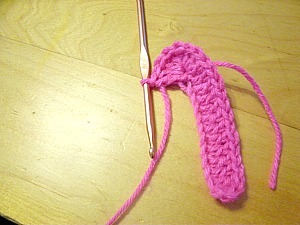 Honestly I would just find a slipper pattern for that size and add the ears and face fromt this pattern :) You might need to use a bigger hook on the ears so they turn out bigger. Adorable! Thanks for sharing your pattern! This person has copied your pattern word for word pictures and all as if she made them and not you. just giving you a heads up.